Even though I have been decorating for Christmas since October, it seems like I just started. Time is passing quicker each year, I am feeling the need to slow down a bit and take in each moment. Christmas will be over before you know it, we have to enjoy each day and relish in this magnificent time of the year. Thanksgiving is in a couple days. Since much of Christmas is already up in our home, and we are enjoying the bright lights and ornaments on the trees, I don’t want to have a traditional Thanksgiving Dinner with Turkey Decor and typical Fall colors. My plan is to have a transitional dinner incorporating my Christmas decor into our Thanksgiving holiday. But how do we do that? There are many reasons I like to incorporate Christmas into Thanksgiving, and one of them is the ease of transitioning to Christmas and beyond. Setting a Thanksgiving table with Christmas elements is a table you can use thru New Years. Maybe change out the centerpiece, glasses, or napkin rings but leave the basic elements and you’re done for the next month. Easy….Peasy. My Thanksgiving table has both Thanksgiving and Christmas elements. The table is set in my kitchen, where my family will dine buffet style for turkey day. My go to store for my transitional Fall/Winter dining table is Hobby Lobby HERE. These gold rimmed dinner plates are $2 a piece! Can’t beat that! 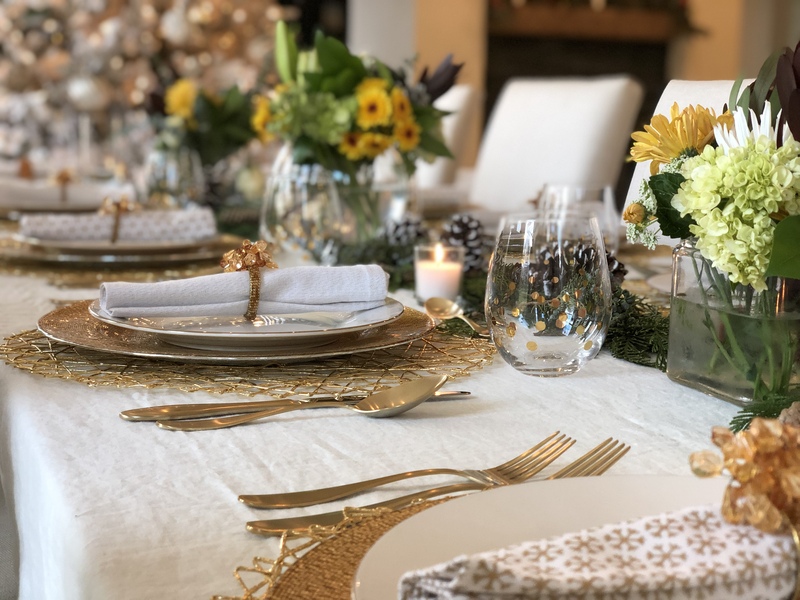 I have the dinner plates set on top of gold glass chargers, similar HERE also from Hobby Lobby, and the wired mesh round place mats…you guessed it Hobby Lobby! Also $2 a piece! My wine glasses were purchased last year from Home Goods and have pretty gold accents. My theme for the Thanksgiving/Christmas table is gold and white, so I have incorporated both elements. For the centerpiece, I purchased 2 bunches of flowers from Costco and divvied them up to make 3 arrangements for the table. The flowers are white Lilies, white Hydrangeas, white Roses and a few yellow/gold Chrysanthemums, which brings Fall color to the table. The cloth napkins, set of 12 for $12 came from Home Goods as well. The package contained 2 different patterns, which I varied on the table. I have been looking for brushed gold flatware for some time. Not wanting to spend a ton on a service for 12, I found a good bargain HERE. The centerpiece is a combination of greens and Juniper. The greens, combined with the scent of Juniper is magnificent and really brings in the feeling of the holidays. I layered the greens on the table down the middle and added in pieces of Juniper and pinecones. You could easily find greens in your yard to layer down your Thanksgiving table. I am using a white linen tablecloth as a base, you can find one at an unbelievable price HERE. My son picked pinecones from our yard to add to the center garland. The napkins rings are ones I have had for years and always use them at Thanksgiving time. The jeweled colors work with the plates, napkins, and flatware. Notice the white tree in the background? 🙂 More about that in an upcoming post. Our children also have a place at the table and have their own monogrammed wooden napkin rings. Combining the elements of Christmas and Thanksgiving makes for an easy transition to the next holiday/season. We are ready to welcome our family and enjoy a Thanksgiving meal together beneath the twinkling lights of a Christmas tree. Happy Thanksgiving from our family to yours. I wish each and everyone of you a joyous and happy Holiday! More Holiday ideas coming your way. I’ll share a lot more of this room next week in my Kitchen Christmas tour. For more posts about the holidays, subscribe to Happy Haute Home and follow along on Pinterest HERE, and Twitter HERE and feel free to pin and tweet your favorite pics from Happy Haute Home. What a great idea……and it looks so lovely! Thank you so much! Glad you like it. Have a wonderful and happy Thanksgiving sweet friend. Thank you Lynn! I know you are crazy busy, I appreciate you stopping in. Have a wonderful Thanksgiving with your family and friends…Hugs! Very lovely table setting Denise Love the shimmering gold! Aww thank you sweet Mel. So happy you dropped in for a Thanksgiving visit. Wishing you and your loved ones a fabulous holiday!